I can’t believe it, but it’s true. We’re at that point in the year where the holidays are at our doorstep. I know I say this all the time, but I can’t get over how quickly time is flying by! If you’re anything like me, you’ve been working hard this year to stay on top of your health and fitness game. Between hitting the gym as much as possible and watching what you eat, you’re feeling pretty great in your skin, and that’s a huge accomplishment. So, since you’re feeling awesome and looking good, too there’s no reason to let it all go out the window during the holidays. Need some ideas for staying on track? Keep reading for a look at how to make it through the season and come out feeling just as healthy and fit. Don’t forgo your exercise routine. It’s going to be tempting to start skipping the gym, but as soon as that happens, it’s a slippery slope. Keep your exercise vibes flowing by making the gym an absolute priority, even on the busiest days. Find classes that work with your holiday schedule – that may mean waking up extra early! Your body, mind, and spirit will thank you. Drink tons of water. This is probably the easiest one to mess up during the holiday season because you’re so busy enjoying festive cocktails! Water is the single most important thing for keeping your body in tip-top shape. Keep a water bottle on hand at all times and stick to getting in your eight glasses a day…hopefully more! Drinking lots of water will help you fend off overeating too…it’ll make you feel fuller for longer, while also keeping digestion working properly. Skip the mindless eating. It’s going to happen…it’s the holidays. There will be cocktail parties with loads of delicious appetizers, big dinners and lots of desserts. But the key here? Only eat when you’re hungry. Try a few things here and there, but don’t overdo it and you’ll be good to go. This one takes a ton of willpower, but if you’ve been willing to work for that gorgeous body all year, you’re willing to keep it up as well. Squeeze in lots of walks. That’s one of the best parts of the holiday season, friends and family love to take winter walks – capitalize on that. If you have a bunch of guests over for a holiday feast, suggest a post-dinner and pre-dessert walk. Not only will your body thank you, but the kiddos will too when you help them get some of their extra energy out before bed. Make your party contribution something healthy. This is the easiest way to get around eating foods that don’t make you feel your best. Bring something you know will keep you satisfied, but make you feel good too. If you’re asked to bring an appetizer, go for a huge veggie platter with some good-for-you dip. If it’s your turn to bring dessert, opt for a giant fruit salad or cut strawberries and fresh whipped cream. You got this. I know it’s tough, especially with all the amazing treats around! 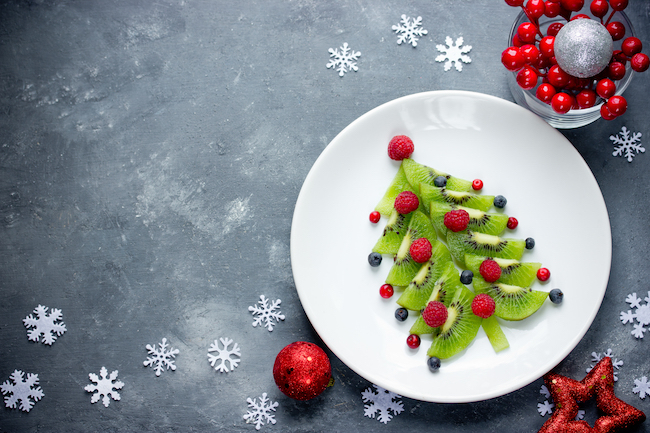 I know I can make a healthy approach to the holidays my priority, how about you?